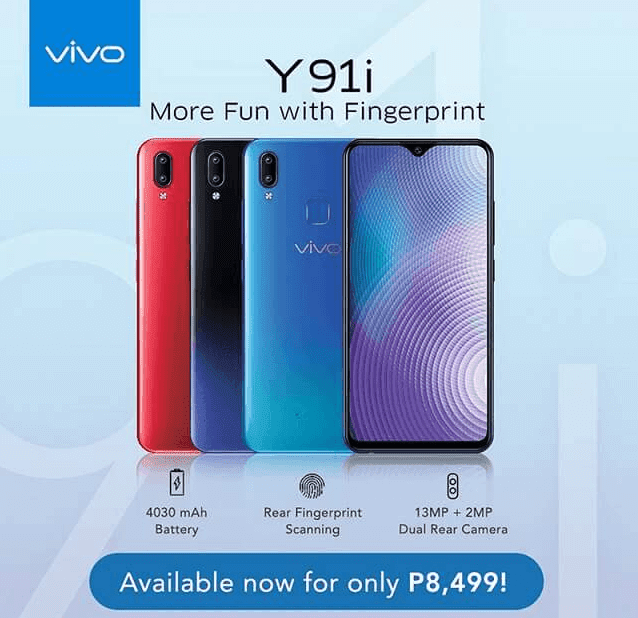 Vivo Philippines announces another budget-friendly smartphone, the Vivo Y91i, The device shares many of the features of its higher-end siblings, the Vivo Y91 and Y95. The Vivo Y91i features 6.22-inch Halo FullView almost-bezel-less notched display with elegant design, powered by Snapdragon 439 octa-core processor. The Vivo Y91i is the toned-down variant of the Y91. Like the Y91, the new Vivo Y91i features a stylish back cover design with gradient colors. The handset features a nice 6.22-inch Halo FullView display with a screen-to-body ratio of 88.6% and a smaller notch at the top of the screen. One the highlights of the Y91i is the stylish 3D curves back-cover, choose between deep black and shimmering blue colors. It has a halo notch and super slim bezels normally found on premium smartphones. The handset also features a huge 4,030mAh power cell for all-day battery life on a single charge. Under the hood, nearly everything is the same with the Vivo Y91 except for the RAM and ROM options. It still goes with the 12nm Snapdragon 439 SoC, 4,030mAh battery and has only 2GB RAM and 16GB of expandable storage this time. The device runs on Android 8.1 Oreo, FunTouch OS 4.5. The handset also features a fingerprint sensor combined with Face Access, for easy unlocking and more convenient. In the camera department, the Vivo Y91i features an 8-megapixel front-camera with AI algorithm that detects gender, age, skin tone, skin texture, and lighting environment. At the back, it sports 13-megapixel + 2-megapixel dual camera, with optimized photo algorithms to capture depth-of-field information to rival professional-grade bokeh shots. The Vivo Y91i is priced at only Php8,499 and now available nationwide at nearest Vivo Stores. You can get it starry black, ocean blue, and velvet red color options.